PLC School holds a stock of course books and learning materials. You can supplement your learning with extra books, or buy a course book and self-study at home. If you are not in Pattaya, you can order a book and PLC School will ship it to anywhere in Thailand (postage is extra). Alternatively, you can call in to the Pattaya Klang branch to view and buy directly. The very latest editions of the course books are designed for blended learning. This means there is enough material for self-study away from the classroom. This is often presented as video, audio, interactive exercises and self testing, along with extra online resources. As a student, you can study the materials as a complete course at home, or you can add extra study time and practice to your class hours by using the interactive materials. Some courses at PLC School are available with online teacher support. In this case, you don't go to class or school. Instead, you can follow the course book and online materials at home, and receive support from a teacher via an internet link. As a self-study student you can learn in any location, when time is convenient, and at your own speed. If you intend to self-study, one of the most important steps is to assess your current level. You can then match the correct materials to your ability. Once your level is known, PLC School can advise you about which course book is suitable for your CEFR level and learning aims. Practice Tests If your aim is to study for a particular exam or test, you can buy an online practice test to help you with the test format. 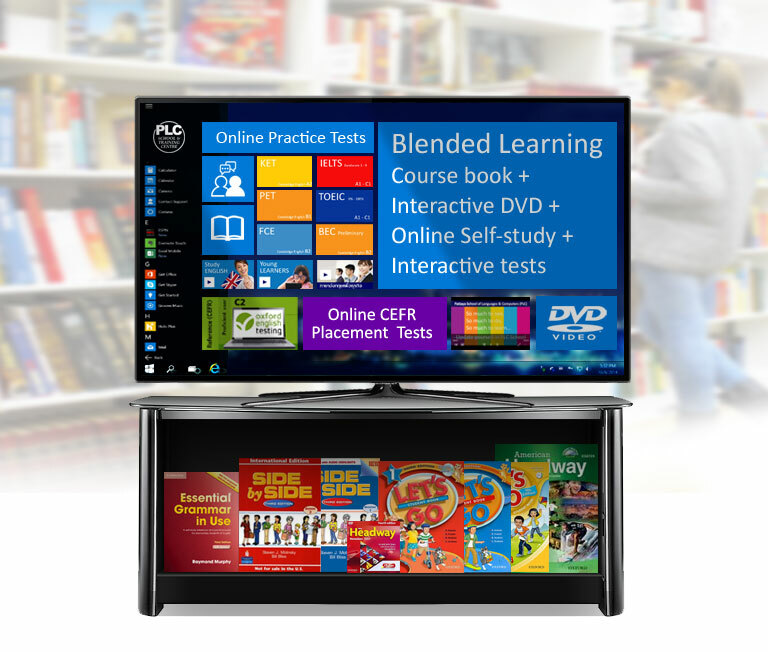 You can buy and study at home, or add a practice test to your current studies at PLC School. You can select a course book to suit your level, aim or purpose. Most offer additional interactive materials. Some offer a full online course. The first step is to identify the kind of learning you require. 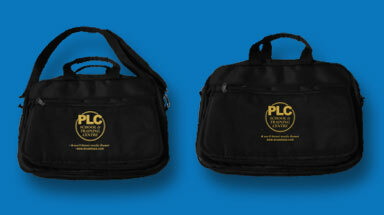 PLC School can advise about titles and prices once your aims and level are known. 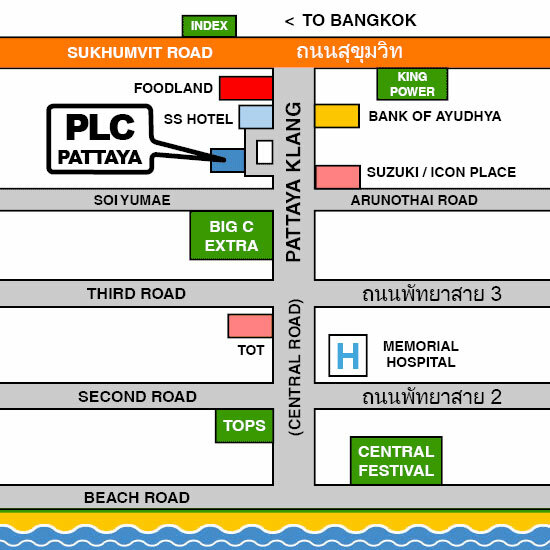 Visit PLC School in Pattaya, or call or email from anywhere in Thailand or Asia and request an online placement test. Cost per test depends on the type and the number of sections. If the test you require is listed, contact PLC School for details and costs. Visit PLC School in Pattaya, or call or email from anywhere in Thailand or Asia and request an online practice exam. Pick up your book from PLC School, or your book will be shipped to your address. At this time, Thai learning materials are connected to classroom lessons at PLC School and are not available online, or as a self-study option. Books are provided when taking lessons in class at PLC School. Resources and books may be recommended for self-study purposes, but are not available to buy from the PLC School Shop at this time. Good quality polo shirt. Embroidered logo front. School name on back and sleeve. Good sized bag with zipped compartments. Handles and strap. 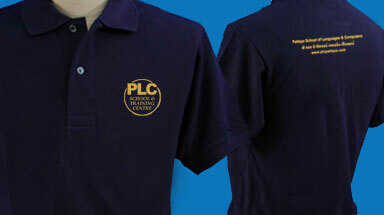 Printed PLC logo. Notebook with lined pages for class notes. Timetable and information on the inside cover.